Business and communications are key words in Krist Pauwels’ life. He started a communications agency, together with his brother, while he was still a student. Following his Master’s degree in psychoenergetics, he founded choco in 2002: the first cooperative communications agency in Belgium, built on the principles of participation and value-driven entrepreneurship. The agency has since handled numerous communication campaigns for various brands, organisations and government bodies. But choco goes further than designing traditional communication campaigns. “We soon realised that we could deliver a far more impactful service if we also helped companies to develop a strong internal culture. After all, beauty comes from within. And that demands coaching, training and well-thought-out communications with your employees,” Krist Pauwels explains. Internal communications, DNA work and coaching for staff and organisations thus became a structural component of choco’s service. ‘We like to call ourselves “relationship builders”,’ says Krist, “because we believe that you get much more from communication if you genuinely invest in the relationship behind it. If you put more value into something then you get more value from it.’ He first set out his views on value-driven cooperation and communication in his publication De Menseneconomie, in which he stated that human capital is the core raw material of the economy. Your Work and Your Life is a persuasive and practical sequel to that work. In his lecture “Your Work and Your Life”, Krist Pauwels calls on us to leave behind the compartmental thinking in which we sometimes trap ourselves and instead to develop a participatory reflex that is the natural result of greater personal awareness, so that every single one of us can engage fully in every aspect of our lives. Life and work become increasingly satisfying for ourselves, our families, our friends and colleagues. 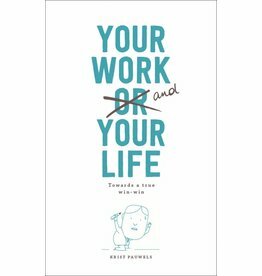 For “Your Work and Your Life”, Krist draws on his personal experiences as advisor and coach for companies, organisations and government bodies. Using concrete examples, he introduces three steps that can be applied every day in your workplace and at home.